In an exchange late Tuesday, Fernando Haddad tried to taunt Jair Bolsonaro into engaging in TV debates, hoping to close the big lead in the polls enjoyed by the far-right candidate. Brazil's two candidates vying for the presidency, far-right Jair Bolsonaro and leftist Fernando Haddad, have taken to Twitter to trade campaign blows in the absence so far of any televised debate ahead of an October 28 run-off election. Bolsonaro, the front-runner, called his leftist rival a "puppet" while his opponent mocked him for avoiding debates, engaging in a heated exchange Tuesday, less than two weeks before their crucial face-off. "Tweeting and online lives are easy, Mr Congressman. 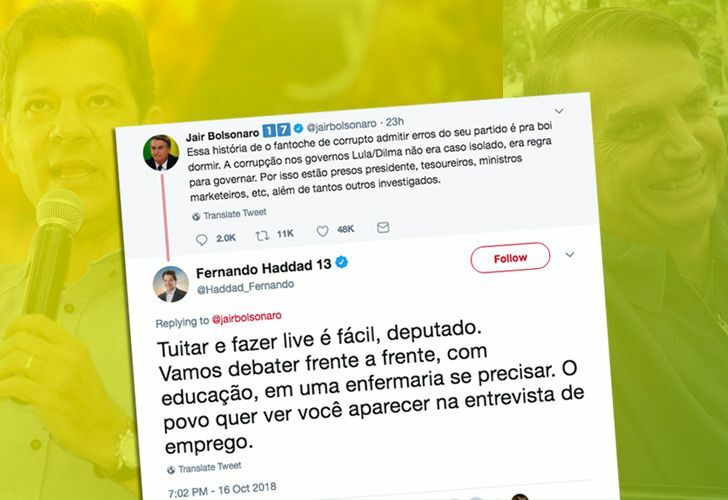 Let's debate face-to-face, politely, in the sick bay if necessary," Haddad said on his Twitter account, hoping to close the big lead in the polls enjoyed by the far-right candidate. The candidates haven't met in any of a series of scheduled televised debates, with Bolsonaro declining to participate after being stabbed during a September 6 campaign event. He was released from the hospital 23 days later but says his doctors recommended against him attending the debates. Six televised debates were scheduled between the October 7 first round – which Bolsonaro won handily, with 46 percent of the vote to Haddad's 29 percent – and the October 28 run-off. Bolsonaro has said avoiding further debates might be a "strategic" choice for him. He already enjoys a big lead in the polls over Haddad and has millions of followers on Facebook, Twitter and Instagram. In Tuesday's exchange, Bolsonaro called Haddad a "puppet guided by a drunkard" — a reference to jailed former President Luiz Inácio Lula da Silva, who hand-picked Haddad to succeed him as the Workers' Party presidential candidate after being barred from the race. "Tweeting and online lives are easy, Mr Congressman," responded Haddad, the former mayor of São Paulo. "Let's debate face-to-face, politely, in the sick bay if necessary. People need to see you coming to the job interview." Tuesday's exchange began after Haddad criticised his own Workers' Party (PT) for recent corruption scandals, which include the huge "Operation Car Wash" (Lava Jato) investigation that has ensnared Brazil's top political and business leaders. Bolsonaro called his rival's acknowledgement of his party's mistakes "deceit" by "the puppet." "The corruption in the Lula [da Silva] and Dilma Rousseff administrations was not isolated, it was a rule of governing," the former Army captain tweeted. Bolsonaro then tweeted: "There is one [drunkard] that was jailed for corruption, and you give him private visits every week." The far-right candidate used a term that describes conjugal visits by partners to male inmates. The PT candidate retorted by criticising Bolsonaro for staying away from the debates while still giving interviews and online speeches. Haddad ended the Twitter exchange with a picture of a TV debate podium and the words: "I am waiting for you here, congressman." Also on Tuesday, Haddad accused Bolsonaro of being endorsed by the Ku Klux Klan. A report by Britain's BBC said former KKK leader David Duke praised the far-right candidate and said he "sounds like one of us." "My adversary is also meeting allies and gathering forces. Today he was endorsed by Ku Klux Klan," Haddad said. Bolsonaro tweeted that he refuses any support coming from supremacist groups. Brazilian supremacist groups have applauded his candidacy. "I suggest that ... they support my adversary, the candidate of the left who loves to segregate society," Bolsonaro said. Bolsonaro has repeatedly defended Brazil's 1964-1985 military dictatorship and made comments deemed offensive to gays, minorities and women. 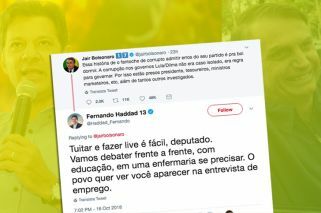 His words with Haddad came as the Workers' Party criticised the other candidates defeated in the first round of voting for not uniting behind Haddad against Bolsonaro. Party chairwoman Gleisi Hoffmann took to Twitter after a poll released Monday put Bolsonaro far ahead of Haddad. "If the Workers' Party were not in the run-off, it would endorse the adversary of congressman Bolsonaro because he will not promote democracy in this country," Hoffmann tweeted. "We hoped that this was going to be a natural move [to endorse Haddad], but I am seeing it is not." "In the future history will judge us all," she said. The only defeated presidential candidate who has endorsed Haddad is leftist Guilherme Boulos, who had minimal support in the opening round. The last major voter survey, by the Ibope institute, showed Bolsonaro the big favourite with 59 percent support, against 41 percent for Haddad.